Creation of milling data in GridPhoto. 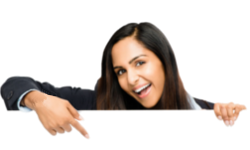 GridPhoto is a convenient solution for 2D photo engraving. Grey scale images are converted from programs using a few Mouse clicks into high quality milling data for almost all 3 or 4 axis machine tools. 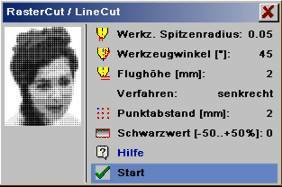 In GridPhoto, grey scale images are processed and converted into dotted or linear milling data. The photos should be available as grey scale images with 256 colours (exception .jpg). The imported images can be edited, scaled, filtered, mirrored and very rapidly converted into milling data. 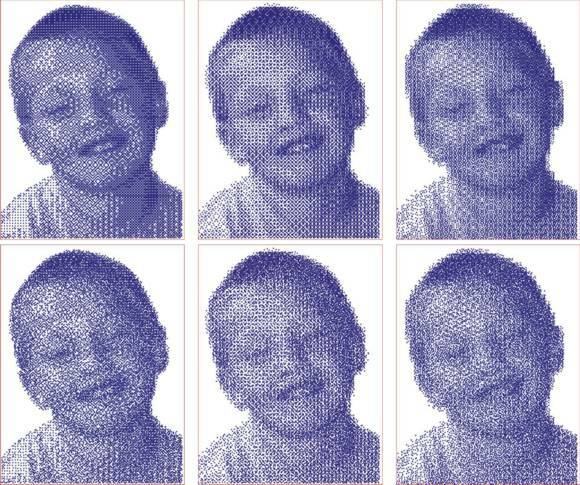 With milling there results a gridded image which resembles a photo, for example in a daily newspaper The light/dark variations (grey scales) in the photo are created through dots or lines with appropriate intensity or density. Using Milling data graphics you can monitor the calculated milling data and, as required, repeat the calculation with modified settings as often as you wish. GridPhoto has available various grid, dither and hatching processes for the creation of optimum milling data. In the grid process grey scales are created through dots with varying diameter and the same separations (3D milling data). 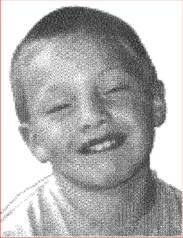 The dither process creates grey scales through dots with the same diameter and variable separations (2Dmilling data). With the hatching process the grey scales are represented through 2D hatching lines in adjustable directions and separations. Help on the functions can be obtained with the activated navigator using , in the menu also using [?] and clicking-on the function. BMP Windows Bitmap, 8Bit grey scales. 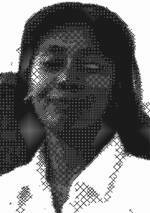 gif CompuServ Bitmap, 8Bit grey scales. 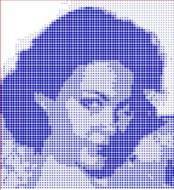 PCX Paintbrush Bitmap, 8Bit grey scales. jpg/JPEG JPEG Bitmap, also 24 colour format. Before calculation of the milling path a photo should be processed into a photostyler (e.g. Corel PHOTO-PAINT) and saved as grey scale image (8Bit/Pixel – not in colour, exception .jpg). Images in the .jpg – format can also be saved as colour images (24Bit). On import these are converted into grey scale images. Gridded photos (e.g. from periodicals) have a very rough surface and should as far as possible be avoided or reworked in a suitable photostyler. Gridded images can also be improved using approximate fine/strong. YES: All axes modified proportionally the same. No: The axes are input individually. Dimension X/Y/Z [mm] Input of the measurements in mm. Edit the relief limits (clip or expand relief). Extract XY: Take over the area to be framed by a rectangle. Add border: Create a border around the relief. Border width [mm]: Input of the additional border around the relief. YES: The relief is continued outwards around the border using the outermost level. The subsequent border level input is inactive. No: The relief is continued outwards using the value given in ‘Border level’. Border level [mm]: Z value for the border around the relief. This value is only effective with the setting ‘Same level = YES’. Only numbers between minimum and maximum relief Z values can be entered. Default is the lowest relief point. Limit top / bottom: Limits the relief in Z (cut off relief top/bottom). 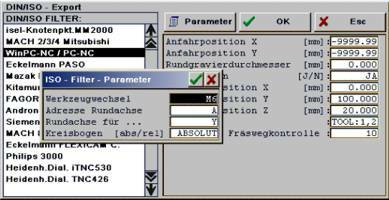 For Z value input first select a suitable (Z) point using the cursor in relief. The Z level can be corrected to the correct value in the subsequent input. Only numbers between minimum and maximum relief Z values can be entered. Following confirmation the relief is correspondingly limited. Adjust a relief in size and resolution. Scaling %: Adjust measurements in X/Y/Z (input in %). With Proportional = YES all axes are the same, with No the axes are entered individually. Dimensions XYZ: Height-Width ratio (input in mm). With Proportional = YES all axes are the same, with No the axes are entered individually. Reduction %: Enlarge image in X/Y remove dots and with this reduce resolution and amount of data. Levels: Grey tone grading, coarsen image in Z. Double resolution: Double resolution of the overall image in X/Y. The position and enlargement remain unchanged. Revise/smooth the photo. Suitable filters are, for example, approximate. Error pixels: Regional filter. The dot, which deviates from all its neighbouring values by more than the specified value, is approximated (smoothed). Outliers: Regional Filter. Delete large deviations to the neighbouring dots. Approximate/ approximate heavily: The relief is smoothed. The approximating can, as required, be repeated several times. Radius filter: Smooth the relief, all edges are rounded off. Correction filter 1: Smooth the relief, all edges are rounded off on one side. Correction filter 2: Fill holes (e.g. after STL import). In the case that it has still not taken place the image can be rotated or mirrored in all axes. Mirror complete image in X, Y, Z and rotate by +/-90°. Mirror X/Y/Z: Mirror image in X, Y or Z.
Countershape XZ: Simultaneous mirroring for a countershape in X and Z direction. Rotate +90°/-90°: Rotate image by +90° (counter-clockwise) or -90° (clockwise). 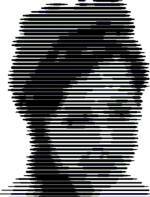 Using line gridding grey scale images are milled using a conical tool in 3D lines. The tool, depending on image brightness sinks to different depths in the material and thus creates the photo in the workpiece. Light areas of the image result in small milling depths and, through the tool cone, small line widths. Dark areas of the image, on the other hand, result in large milling depths and wide lines. With import of the photo the image is converted into a relief. The measurements X/Y are the dimensions of the photo (reliefs). These ca be adjusted using ‘scaling’. The milling depth is determined by the relief depth (input/modification, for example using scaling . dimension Z). For the engraving of photos no large milling depths are necessary, usually a few 0.1 mm suffice. The normal procedure is the engraving of the image and subsequent covering (filling) of the cutter track using colour. With the employment of multi-layer material the thickness of the upper milling layer must be noted (set the safety height (Off) higher and incise slightly deeper). 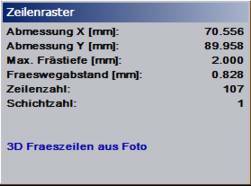 Measurement X/Y [mm]: Measurements of the image and the engraved workpiece. Max. milling depth Z [mm]: Indication of the tool insertion depth in the material (relief depth). Milling path separation: The milling path separation (separation of the milling lines) is tool radius multiplied by the line separation (/100%) with max. depth. The milling path separation is heavily dependent on the tool angle TAn) and the relief depth. Smaller tool angles or smaller milling depths result in more milling data. The more lines which are milled the better effect the image has. But with this the milling time increases. Line number: Number of determined milling lines. No. of layers: Calculated number of layers. If the ‘layer depth’ is selected >= ‘Max. Milling depth Z’, then there is only one milling layer. Tool #: Selection of a suitable milling tool. For milling, conical tools (with cone angle (CAn) >0°, e.g. 20..30°)are always to be employed. The cutter tip should be selected as small as possible (CuT <0.1 mm). For small cutter tips always pay attention to sufficient rpm. Line separation [10..500%]: The line separation is related to the tool radius with max. milling depth (100%). The milling path separation is determined by the line separation. A larger line separation results in a larger milling line separation and an image with a lighter effect. Recommended settings for photo engraving are 100% .. 300%. Reliefs (e.g. Lithophane for transmitted light) can be milled using the program. For this a tool with larger tip radius or spherical radius and smaller line separation (ca. 10..50%) is to be selected. With line gridding only a tool offset of the cutter tip is calculated. We therefore recommend the relief module or the program eMillRelief for correct relief production. Angle [-90..+90°]: Setting of the angle of the milling lines. 0° produces horizontal lines. Simple lines without turnaround + 90° rotated crossings. Lines in zigzag order + 90° rotated crossings. Simple radial lines without turnaround. Radial lines in zigzag order. Elliptical spiral go over to rectangle form. Layer depth [mm]: Dependent on the Max. Milling Depth Z the image can be milled in one or more layers. If the layer depth is exceeded, the program creates several milling layers. Contrast [-0.5..+0.5]: With values >0 the image is higher-contrast (light and dark grey scales are reinforced). With values <0 are milled with less contrast. Inverse [Y/N]: YES: The brightness levels are inverted. Light areas are milled dark, dark areas are milled light. Using gridding the grey scales in the image are created by dots of various diameter and the same separations. The variable dot diameters are created using a conical tool, which is sunk (inserted) appropriately deep into the material. Small dot diameters are achieved through small insertion, large dot diameters through strong insertion (3D milling data). Conical tools and a 3D machine tool are demanded for the grid process. Dimensions X/Y [mm]: Dimensions of the image and of the workpiece. Max. milling depth Z [mm]: Indication of the greatest milling depth (for black dot) in the material. The max. milling depth results from the dot separation and the tool angle. Number of dots X/Y/total number of dots: Possible number of dots if all dots in the lines are milled. At ‘white’ points in the image no dots are milled. Please not the indication of the number of dots during the input. The milling time (ca. 1-4 dots/sec) can be estimated easily using the number of dots. Tool tip radius [mm]: Smaller dot separations and a greater total number of dots can be achieved using a small tip radius. The tip radius should be selected as small as possible (finest grid dot). Tool angle[°]: Conical tools are required for gridding. Convenient tool angles lie at 40..49°. Smaller tool angles increase the milling depth. Safety height (SH) [mm]: Safety clearance of the cutter tip to the surface of the material for withdrawn movements. The smaller the safety height is chosen the more dots can be milled at the same time. Processes: Milling processes for the image. Each dot is milled vertically from the safety height into the material (long movements). The dots are milled into the material inclined along the tool angle. Up to the next dot an inclined movement takes place up to the material surface (short 3D movements). The individual milling depths are connected together by lines so that milled lines of different depth and thus different stroke widths result (short 3D movements). The dots are milled inclined along the tool angle into the material. Up to the next dot an inclined movement up to the safety height takes place (long 3D movements). Dot separation [mm]: Separation of the grid points. The dot separation must be selected at least 4 x Tool tip radius, otherwise no contrast is possible within the image. The greater the ratio Dot separation/ Tool tip radius is selected, the more contrast is possible in the milled image. Density value: A density value < 0 results in a lighter image after the engraving. The dither process creates the grey scales in the image through dots with the same diameter but variable separations (2D milling data). Cylindrical or conical tools can be employed for the dither process. A 2D (2.5D) machine tool suffices for the milling processing. The dither milling data can, in a wide range, be matched to the job definition. An image milled using the dither process is effective from a minimum viewing separation. A sufficiently large image should also be milled. The program offers 3 milling processes: Dithering 9p, Dithering 16p and Dithering 25p. Dithering 25p should be used for large area images only, Dithering 9p is suitable for rather smaller images. Through the relatively large-area dither dots the dimensions of the graphic cannot be adhered to exactly. The deviation of the milled image is visible in the graphic. Display in the upper window. Max. milling depth Z [mm]: Indication of the tool inserted (sunk) depth in the material. Number of columns X / lines Y: Possible number of the dither dots if all dots are milled in the lines. No dots are milled at ‘white’ points in the image, a dither dot consists, depending on the process, of several (up to 9, 16, 25) 2D dots. Tool tip radius [mm]: Smaller dot separations and a greater total dot number are achieved using a small tip radius. The tip radius should be selected as small as possible for a high image resolution. Tool angle[°]: Cylindrical [0°] and conical tools [>0°] are employed for dithering. Convenient tool angle lies at 10..20°. Safety height (SH) [mm]: Safety height of the cutter tip to the material surface for withdrawn movements. The smaller the safety height is selected the shorter is insertion (sink) movement and the more dots can be milled at the same time. Inserted (sunk) depth [mm]: Milling depth of the tool measured from the tool tip to the surface of the material. Density [-0.5..+0.5]: Change the milling dot density. With values <0 the dots are more dense, with values >0 are wider displaced. Spread [0..1]: Spread of the individual dots. With the setting 0 the dots are placed at regular intervals (best quality). Using larger settings the dots are dispersed. A spread results in a small reduction in quality. The image appears somewhat washed out/blurred. Brightness [-0.5..+0.5]: With values >0 the image is milled lighter, with values <0 milled darker. Contrast [-0.5..+0.5]: With >0 the image is milled with higher contrast, with values <0 with less contrast. YES The brightness level is inverted. No Brightness distribution as in the model. Processes: Dither milling processes for the image. Dithering 9p: For rather smaller images with reduced grey scale intensity. 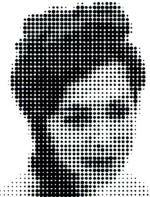 For 1 dither dot 0(white) .. 9(black) individual dots are milled (fine resolution). 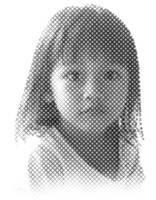 Dithering 16p: For medium-sized image sizes with sufficient grey scale intensity. For 1 dither dot 0(white) .. 16(black) individual dots are milled (medium resolution). Dithering 25p: For larger images with many grey scales. For 1 dither dot 0(white) .. 25(black) individual dots are milled (coarse resolution). Comparison of the dither processes. From left to right 9p, 16p and 25p. Above spread 0, below spread 0,5. Same image as above but double dimensions and brightness + contrast respectively 0.1. Setting s. image. Milling data view setting Relief view. Convert grey scale image into hatched image. For this the grey scale number is reduced and the individual level replaced by hatching so that a gridded image results. For an as high as possible contrast result a photo should be processed in a photostyler beforehand. Here, disruptive elements should be removed and a stronger contrast selected. For the hatching a tool must be determined whose tip is to be selected as fine as possible (Cutter tip [CuT] 0.05..0.1mm). The hatching separations are determined automatically using the cutter tips, the grey level and the following settings. Hatching levels [1..32]: A grey level image (256 levels) is reduced to 1..32 hatching levels. Sensible are 4..32 hatching levels. Density [-20..100%]: Change hatching density (line separation). The effect corresponds with the contrast setting. Values < 0 reduce the contrast, values > 0 raises the contrast. Brightness [-20..100%]: Change hatching separation for all hatching levels uniformly. The effect corresponds with a brightness setting. Hatching contour separation [0..100%]: Determines the safety separation of the milling tracks in the milling direction to the contour (track). With the selection Combine hatching lines = YES this value must be > 0 and lie at ca. 50% (>10% .. 70%). -2 The hatching angle is automatically set for each layer with increasing value. -1 The hatching angle is automatically set for each layer with increasing value and alternatively displaced by ca.90°. 0..180 The hatching angle is set for all angles at the specified value. 1 Hatching lines in set direction only. 2 Hatching lines in set direction, displaced + 90°. 3 Hatching lines in set direction displaced + 60° and 120°. Join hatching lines [Y/N]: YES: The hatching lines are joined together. Add hatching contours [Y/N]: Yes: Save the hatching limits to the created paths. 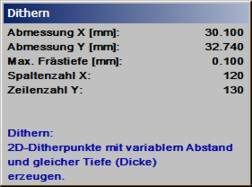 For the creation of milling data complete tool information is required. The tool data are entered in the tool list. The tool list can be reached with Tool Input. This setting of the milling data view is employed if milling data has been calculated using gridding, dithering or hatching. The black indicated form of view is set. The forms of view in blue can be selected. Milling point: Drawing of the milled image in plan view with filled cutter trace (cutter simulation, rapid display). Relief view: From the milling paths a relief (3D form) is calculated and drawn in grey scale image (slow display due to the high computing time). Render view: A rendered image is calculated from the milling paths and is displayed (slow display due to high computing time). Relief colour: Representation of the relief and render view. milling points are presented dark. milling points are presented light. Drawing of the milled image in plan view with filled cutter trace (cutter simulation). Take over the milling data in a graphic layer. Following calculation, the milling paths can be exported in various formats. In the Navigator the most important program functions are summarised in the correct processing order. The Navigator leads you through the processing. Processing takes place from top to bottom. You can select the function marked in black. If a function is not to be selected then, using next you switch to the next operation. Using back you switch to the previous function. Open (Import photo): Import a grey scale image and adjust the dimensions (measurements). Filter: Rework/smooth (finish) the image. Suitable filters are, for example, approximate. Mirror+rotate: In the case that it has still not taken place, the image can be rotated or mirrored in all axes. Gridding. With Gridding the grey scales are created in the image through dots with different diameters and the same separations. Dithering. The Dither processes create the grey scales in the image through dots with the same diameters and variable separations (2D milling data). Hatching. Convert grey scale image into hatched image. 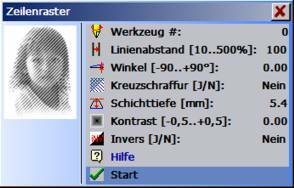 For this the grey scale number is reduced and the individual levels is replaced by hatching so that a gridded image results. Milling data export: Following calculation the milling paths can be exported in various formats. End Navigator: Program operation without Navigator. Now all menu functions are available. For operation please follow the program help [?] or and click-on the function. Work specification: milling data from photo. Using GridPhoto grey scale images are converted into milling data for 3 or 4 axis machine tools. The photo must be available in a readable pixel format (BMP, PCX, gif, jpg) with 256 grey scales. Photos in other formats must be converted into the required format beforehand using a standard photostyler (e.g. Corel Photo Paint). In the photostyler, delete unwanted areas of the image and cut the image into the desired dimensions. Convert colour images and images with other tones into greyscale images with 256 gradations (grey scales (8 Bit)).Alternatively, you can also save the image in .jpg format with 24 Bit colour depth. To work with GridPhoto the employment of the Navigator is recommended (it is active with first start). You open the image file using Import Photo. The program immediately shows you the input to the image scaling. Here you set the dimension of the milling data. For the example dimensions of X = 50 mm, Y = 54.4 mm are desired. For this, first put proportional to YES and change the dimension X to 50 mm. After clicking-on the next number all values are changed proportionally (the image format is retained). The image is present in an unsatisfactory quality. The quality can be improved using the installed filters. Using approximate the image is smoothed and somewhat improved. As required the image can here be rotated or mirrored. For this case the image is to be gridded using 3D dots. for this the function Gridding is selected (settings see picture). Before export, the milling paths should be viewed regularly using Milling data graphics. For these milling data a 3D milling machine with controlled X, Y and Z axes is required. Exported are the milling data using Export milling data andthe selection of the desired export filter. 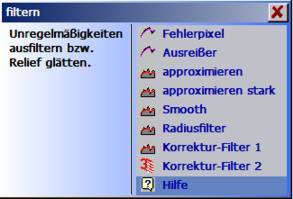 In Export filter selection, select for example DIN/ISO and the export filter WinPC-NC / PC-NC. Note: For PC-NC the core image format for arcs (ABSOLUTE/relative) must be set the same in both programs (under Parameter). The approach position, with -9999.99, can be switched off for X and Y. In this case the working off starts with the 1st work position.